A pleasant walk on a nice day. Can be very windy at times, and at high tide it can be dangerous crossing the causeway from the carpark. On fine sunny days the main danger is the many people walking up to enjoy the view! The walk takes about 30 minutes. If you are more energetic consider doing Deliverance Cove as well. 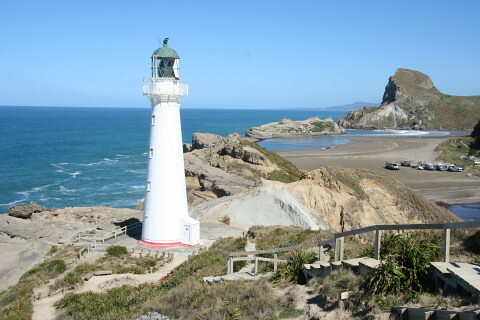 Castlepoint is about 60 km (1 hour drive) east of Masterton. The route is well signposted and the road is sealed all the way. Tinui is a pleasant place to stop for afternoon tea and crafts. Bicycles are not welcome nor practical. There are steep cliffs so stay on the walkway.